They were fantastic and every day was a new adventure. Every guide was expert, friendly and nothing was too much trouble. Co-ordination was brilliant and all of our drivers were safe and amazing. The itinerary was perfectly designed and managed thanks to Minh Vu who even saw us safely on the train to Sapa. We would do it again in a heartbeat. 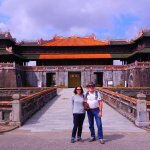 A hassle-free way for a couple in their 60s to experience a wonderful country in Vietnam and then they provided the same service in Cambodia. Can’t recommend highly enough.